According to my count, there have been 26 elections where a sitting president was not on the ballot. In 1848, incumbent President Polk did not run for reelection but former President Van Buren ran as a third party candidate. Another interesting question might be "How many times has there been an election without an incumbent president or vice president on the ballot?" We'll save that for another day! The 20th Amendment says: "the Congress may by law provide for the case wherein neither a President elect nor a Vice President elect shall have qualified, declaring who shall then act as President, or the manner in which one who is to act shall be selected, and such person shall act accordingly until a President or Vice President shall have qualified"
In other words, if no one qualifies by inauguration day, Congress should make a law that decides what happens next. The current version of that law was created in 1947 and is called the Presidential Succession Act. It says that if there is no president or vice president due to death, resignation, removal from office, inability, or failure to qualify then the Speaker of the House of Representatives, after resigning from that post, would become the acting president. That person would act as president until there was a qualified president or vice president who could then take over. In the case of deaths or resignations that time could very well be the next election in four years. If the Speaker of the House of Representatives is not qualified to be president (due to age or place of birth, for example) or if there is no Speaker of the House at the moment, then the Presidential Succession Act has a list of the next people in line who would become acting president - from the President pro tempore of the Senate all the way through the various Cabinet secretaries. - in 1976, President Gerald Ford faced a tough primary battle with Ronald Reagan. Going into the convention most believed the race was actually too close to call. Ford was renominated but lost the general election. - in 1980, President Jimmy Carter had a bitter battle for the nomination with Ted Kennedy. Carter won a majority of the delegates but Kennedy refused to concede and tried to get the rules changed at the convention so delegates could vote for whomever they wanted. His effort failed, but in the general election so did Carter's reelection bid. - in 1992, President George Bush fought off a challenge from Pat Buchanan. However, to help consolidate the base he moderated his views and let Buchanan give the keynote address at the convention. His plan evidently backfired as he was not reelected. As you can see in the recent past presidents who do get challenged for their party's nomination have not fared well in November. Roberts started the oath. Obama unexpectedly interrupted and started repeating the oath prematurely. Roberts paused to figure out where to pick up the oath, and in doing so got flustered and put the word "faithfully" out of order and substituted the word "to" for "of". This flustered Obama who stopped after repeating a few words, realizing something was wrong . Roberts then repeated the line with "faithfully" in the right place but leaving out the word "execute". Obama said the line, but with "faithfully" in the wrong place. They then both got back on track and finished it out. All in all let's call it two mistakes by each of them. What this means is that even men as important as the President and Chief Justice can get nervous during historic events in front of large numbers of people! Both made mistakes and both moved on. So should the rest of us! So is Obama officially the president since he did not say the oath as prescribed in the Constitution? Absolutely he is. As I mention in another question, the 20th Amendment is clear that "The terms of the President and Vice President shall end at noon on the 20th day of January... and the terms of their successors shall then begin". The only outstanding question would be could he execute the office of president without saying the oath. Fortunately this should not be an issue anymore since the day after the inauguration Obama and Roberts met in the White House and did a do-over! (You can listen to it here.) Was this necessary? I'd say yes. No court would have ever accepted a challenge to his legitimacy over this. But it is always better to follow the Constitution to the letter (or the word in this case!) for propriety's sake. It was the right thing to do. And it will forestall any complaints over the next four years from any conspiracy theorists! 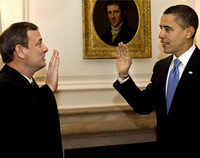 In subsequent inaugurations, Roberts divided the oath into smaller, more easily repeatable phrases. There is some debate. The 20th Amendment says "The terms of the President and Vice President shall end at noon on the 20th day of January... and the terms of their successors shall then begin". Article II of the Constitution says "Before he enter on the Execution of his Office, he shall take the following Oath..." Based on a literal reading my interpretation is that the president elect's term begins at noon on January 20th no matter what. However, he should not "officially" execute the duties of his office until he has taken the oath. While the Constitution bars people from holding more than one office at a time, nothing prevents a candidate from running for more than one office at a time. In 2000, Joe Lieberman was at the same time the Democratic nominee for Vice President and the incumbent Democratic nominee for Connecticut Senate. He lost the former and won the latter. This is not new. For example, in 1880, James Garfield was a member of the House of Representatives. He was then elected by his state legislature to the U. S. Senate (back before the 17th Amendment was enacted to let citizens choose Senators.) Before he was seated in the Senate he was elected President. So at the same time he was a House Representative, a Senator-elect, and a President-elect! He resigned from the House, surrendered his Senate seat, and was inaugurated as President. No. The 22nd Amendment states that if a person fills two or more years of a presidential term someone else was elected to, they can only run for president themselves one time. If no candidate receives a majority of the electoral votes (currently 270 out of 538) then the election is thrown to Congress to decide. It makes no difference if there is a two way tie of 269-269 or if there is a three way split of 269-250-19. Ridding the process of the actual electors and instead assigning the winner of each state a number of electoral votes would remove the major problem associated with using people -- faithless electors. For the most part we don't actually need the voters themselves anymore and that's one electoral vote proposal I would not be against. However, while you remove certain possible problems you also remove some of the benefits. One strength of the current system is that it is much more flexible with unforeseen situations. For example, assume both a presidential candidate and his running mate are killed two days before election day. With automatic electoral votes what happens if they were leading and would have won -- or what happens if they do win? With actual electors the party of the dead candidates could tell voters "go ahead and vote for them and your vote will actually count for these replacements". They would then instruct their electors to vote for those. And a major crisis is much more easily resolved. That's an extreme example, but shows that having actual people rather than automatic votes can be useful in unexpected situations. One last thing to note. Changing to an automatic system would require a Constitutional amendment. States are allowed to choose the manner their electoral votes are chosen, but in the end they are required to have actual electors making actual votes. The Constitution lays out the qualifications for President but doesn't seem to actually require any one to check up on them before hand! Congress can challenge the electoral votes of any candidate, but that is only after election day. The courts would appear to be the best avenue to go before an election, but judges are going to be reluctant to intervene in all but the most extreme cases. The parties themselves are the best place to ensure their candidates qualify, as they won't want to waste the time and money on a candidate who may later be disqualified. But they may not have a very open process and they won't necessarily have the best interests of the people in mind. The media should take a look at this issue were it to arise but with even the press becoming more partisan and each outlet seemingly taking sides for and against candidates they might not be that trusted by the populace anymore. The reason it was fair was because both President Bush and Mr. Gore were told the rules before the election started. And one of those rules they agreed to play by was that popular votes don't count. Only a special type of vote called electoral votes would matter. Both President Bush and Mr. Gore were trying to get electoral votes. If the rules said the popular vote decided the winner then both men would have done things differently to try to get those votes. Since they both knew those were the rules it would be unfair to change them after the election. Here is an example to help show what I mean. Let's pretend you and a friend are picking flowers for your parents. You decide to make it a game by saying "whoever gets the most yellow flowers wins". After picking flowers for a while you get together to count them. You have 10 flowers and 6 of them are yellow. Your friend has 12 flowers and 4 of them are yellow. That means you win since you have the most yellow flowers. Would it be fair for your friend to say he should be the winner because he picked the most flowers? No, because the rule was whoever picked the most yellow flowers wins. If the rule had been whoever picked the most flowers wins you would have played differently by trying to pick more flowers rather than spending extra time looking for yellow ones. I hope this helps you understand why it was fair. Some people think we should change the rules. And that would be OK, as long as you do it BEFORE the game not after! Since I finally changed the colors on my maps to match what everyone expects after the 2000 election, this has now become the most asked question I get! I've answered here before but since it still gets asked so often I've written a more in depth article that explores the scenario. Check it out here: Death of a President (Elect). The short answer is yes, technically a Presidential and VP team can be from the same state. However there is a reason you don't see it. The 12th Amendment says that an elector casts separate ballots for president and vice president. It further states that at least one of those two candidates can't be from the same state as the elector. So if you had running mates both from Tennessee, for example, it would not be an issue in 49 states. But the electors in Tennessee could only vote for one of them. That could be hugely significant in a close election. You need 270 votes to be elected. So Bush still would have won. But since no one would have received 270 for vice president the election for that post would have been thrown to the Senate! As you can see it's just not a good idea to risk having your presidential nominee and his running mate being from the same state. The un-amended Constitution also had this "Habitation Clause" and it had a small effect in the second presidential election. In 1792, the Federalists voted to retain George Washington as President and John Adams as Vice President. The Democratic-Republicans, as they came to be called, also voted for Washington but objected to Adams. They instead voted for George Clinton for VP. They would have preferred to vote for their leader, Thomas Jefferson, but since he was from the same state as Washington the 21 Virginia electors (representing almost a third of the votes needed to win) would have been Constitutionally barred from doing so. The 22nd Amendment to the Constitution says: "No person shall be elected to the office of the President more than twice, and no person who has held the office of President, or acted as President, for more than two years of a term to which some other person was elected President shall be elected to the office of the President more than once". So eight years elected on your own + two years of someone else's term gives the 10 years total you mention. Note that this does not allow someone to be elected three times and resign half way through their third term. The two year part has to be part of someone else's term. What about John Quincy Adams in 1824? There's the tricky bit -- re-read the question. While Adams did receive less popular votes that Andrew Jackson, he did not win the Electoral College vote to become President! He was elected by the House of Representatives after no one received a majority of the electoral votes. 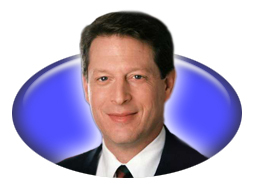 Yes, Al Gore could serve as vice president again. The 22nd Amendment only prevents people from serving as president more than twice. Besides not meeting the Constitutional requirements for the job, the only thing that can prevent someone from becoming VP is if they have also served as president twice. The 22nd Amendment would then probably bar them from becoming vice president. Throughout history only two men have served as vice president under different presidents (though both were before the 22nd Amendment). George Clinton was VP under Thomas Jefferson from 1805-1809. 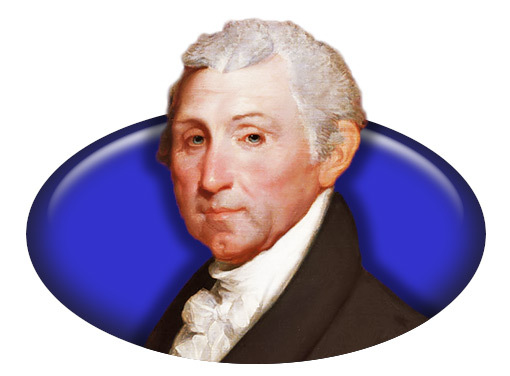 He then served as VP for James Monroe from 1809 until his death in 1812. John C. Calhoun was VP under John Quincy Adams from 1825-1829 and then under Andrew Jackson from 1829 until 1832 when he resigned to become a Senator. The 22nd Amendment to the Constitution says, in part, that "No person shall be elected to the office of the President more than twice". It does not distinguish between consecutive or non-consecutive terms. So you can be elected twice in a row, or you can win one term and then one other term sometime later in the future. Either way, after two terms you can not be re-elected. Only one person has been elected to non-consecutive terms (though it was before the 22nd Amendment). 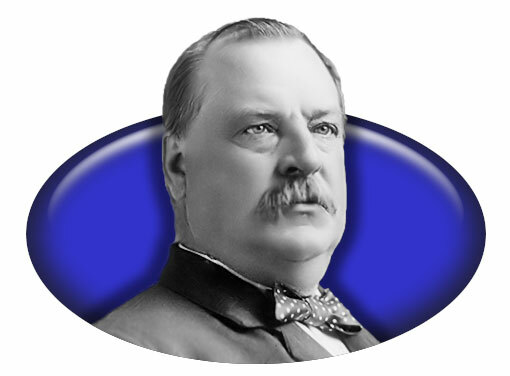 Grover Cleveland was elected president in 1884, lost re-election to Benjamin Harrison in 1888, then defeated Harrison in 1892. Cleveland is counted as both the 22nd and the 24th president. Unlike the other 48 states (and DC) that allocate all their electoral votes to the winner of the state, Maine and Nebraska use a system that gives one electoral vote to the winner of each Congressional district in the state and two electoral votes to the overall winner of the state. This means these two states could split their votes between candidates (as Maine did in 2016 when Hillary Clinton and Donald Trump each won one of the state's two districts). How would the razor thin 2000 election have turned out had every state used this model rather than the winner-take-all system? Perhaps counterintuitively, popular vote losing George W. Bush would have won the Electoral College by an even wider margin! Several people have done this analysis and all are within just a couple of electoral votes of each other. The source I'll mention here is Jeff Sagarin (of the well known football rankings fame). He has calculated the results of the elections from 1968-2000 using the Maine-Nebraska "District Plan". 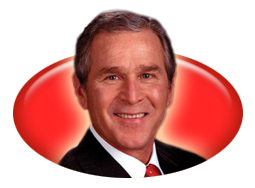 His results show that in 2000 Bush would have beat Al Gore by 36 electoral votes, 287-251 (the actual results were 271-267). So how could allocating electoral votes closer to the people have actually increased the disparity with the popular vote? Perhaps one reason lies in the fact that Gore mainly won states with a lot of electoral votes, and in those states he mainly won the urban and metropolitan areas. That leaves a lot of room for the opposing party to pick up votes in a district system. For example, in California Gore won all 54 votes in the winner-take-all system, but in the district system Bush would have picked off 19 of those votes - a huge amount in a close election. This, of course, occurs all over the country and helps or hurts both candidates. But it hurt Gore more because he won more of the big states. Of the 9 states with more than 15 electoral votes, Gore won 6. In those states Gore would have given up 51 votes to Bush, while Bush would only have returned 28 votes to Gore from his 3 large states. A second factor also aides Bush. In a hypothetical district system, Bush would have held his states better than Gore. In 19 of the 30 states Bush won (or 63%) he gave up only one or zero votes to Gore. Gore was able to do this in just 9 of the 21 states he won (or 43%). This is all hypothetical. If this system were in place candidates would have changed the way they campaign. And 2000 was a strange election result for several reasons. So you can't really use it as a basis to judge the district system. But one thing is certain. You could not count on it to better represent the popular vote than the current system! You're asking the wrong question! Try to find in the Constitution the definition of natural born citizen! It's not there, which means Congress decides what it means. That doesn't mean it's settled though. Technically the issue has never been decided for determining presidential eligibility. But most think the rules that apply for every other aspect of citizenship apply to this requirement as well. In fact on April 30, 2008, the Senate unanimously passed a resolution stating that McCain was "a 'natural born Citizen' under Article II, Section 1, of the Constitution of the United States". But don't be surprised if some political group still tries to challenge it! This issue has actually come up several times before but wasn't decided satisfactorily due to the candidates in question losing. For example, in 1964, Barry Goldwater was the Republican candidate for President. Although he was born in Arizona, it was not yet a state at the time. George Washington and James Monroe. In the very first election in 1789, electors were chosen in several different ways: two states held at large direct elections, two states held direct elections by district, four states had the state legislature make the choice, two states used a combination of direct voting and the legislature, and three states did not send electors. Also different in 1789 was the fact that each elector got to vote for two people for president. In the end there were 69 electors from 10 states, and every one of them placed Washington's name on their ballot. In 1792, three states held at large direct elections, two states held direct elections by district, nine states had the state legislature make the choice, and one state used a combination of direct voting and the legislature. From 15 states, each of the 132 electors once again listed Washington as one of the two names on their ballot. By 1820, electors cast separate ballots for president and vice president. Nine states chose electors by at large direct election, six states had direct elections by district, and nine states had the legislature make the decision. Monroe, running unopposed for reelection, won every state and should have won every elector. However, even though Monroe won the at large election in New Hampshire, one of his electors instead voted for John Quincy Adams. Third party or independent candidates only need to worry about getting on the actual November election ballots. Independents just say they're running and then get to work on getting their name on the ballots state by state. Third party candidates would need to go through their individual party methods for declaring and then win that nomination - usually during a spring/summer convention. For more information on the actual process independents and third parties have to go through to get on the ballot for the general election, visit Ballot Access News - a wonderful site dedicated to reporting about the efforts non-Democrats and Republicans are required to take to participate in elections. 3) have been a resident within the United States for fourteen years. 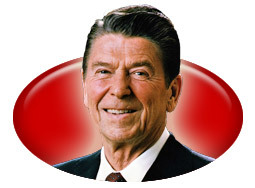 Ronald Reagan was 73 years old when he won a second term on election day 1984 (26,938 days old to be exact). Donald Trump was the oldest person to be elected to a first term as president at age 70 (25,716 days). That depends on how you interpret "a minority of the popular vote"! If you mean how many times has the winner not won a majority of the popular vote - or more than 50% - then it has happened more often than you might think! 19 times! If you mean how many times has the winner not won a plurality of the popular vote - or more than his opponents - then the answer is 5. There is no law or Constitutional requirement that says the Chief Justice has to swear in the President. It is just a tradition, not a neccesity. 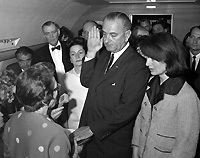 The oath has been given by someone other than the Chief Justice 8 times, most recently in 1963 when Lyndon Johnson was given the oath by a local judge in Dallas aboard Air Force One after the assassination of John Kennedy. A candidate must win a majority of the electoral votes to become president. Currently, that means at least 270 votes are needed to win - a majority of the total of 538 votes. As you noted, we get the numbers for the Electoral College from Congress. 100 Senators + 435 Representatives = 535. But there are 538 electoral votes! The District of Columbia does not have full official representation in Congress. The 435 official members of the House and the 100 Senators all represent the various 50 states. The other 3 votes come from the The 23rd Amendment to the Constitution which states that DC is allowed to appoint electors to the Electoral College. The number they are allowed is equal to the "number of Senators and Representatives in Congress to which the District would be entitled if it were a State", but no more than "than the least populous State". Since several states only have 3 votes, DC can have no more than 3 votes even if their population would normally warrant more. BTW - The District of Columbia does have one non-voting member in the House, but this person is not a full-fledged Representative, and is in fact not even called a Representative - they are called the DC Delegate. The Electoral College has tied only once - in 1800. The Constitution didn't originally envision two candidates running together as a President/Vice Presidential team. Back then whoever got a majority of the electoral votes won and whoever came in second became vice president. When Thomas Jefferson and Aaron Burr ran together as running mates, they apparently forgot to factor in that they would probably get the same number of votes running as a team! They tied 73-73. Burr, who was supposed to be the VP candidate decided he might win the presidency and fought for it in the House election. It took the Representatives 36 ballots over 6 days to finally declare Jefferson the winner. This election led to the ratifiacation of the 12th Amendment which changed the electoral process to the one we use today. You are correct. In almost every state they will not split the electoral votes even if both candidates are within 1% of each other! But you asked "Why can't the votes be split in case of a close race"? The answer is they can be! The Constitution allows each state legislature to decide how to allocate their electoral votes. If Idaho or California wanted to, they could simply pass a law that says they will split their electoral votes according to the percentage of votes won by each candidate! In fact two states already do something similar. In Maine and Nebraska, the candidate who wins the state gets only 2 electoral votes. The rest of the votes are allocated based on which candidates wins in each Congressional district! The candidates' lists of potential electors are not secret. Several states post the lists of electors on their websites. You should be able to get the list by writing or calling your state board of elections. The same thing that happens when there is not a tie in the popular vote - nothing! The Electoral College elects the president. The nation-wide popular vote has no legal significance in our electoral system so a tie would not effect anything, nor require a recount. Now a tie in the popular vote within a state? That does matter! If a state had a tie in its popular vote, they would have a recount. If (after what would probably be several recounts) the vote was still tied, then state law would govern as to what happens next. Neither! If the candidates tie 269-269 then Congress would decide the winner. The 100 members of the Senate would choose the next Vice President from among the top 2 electoral vote getters. The voting procedure here is much more straightforward. At least 67 Senators must be present, and each person casts one vote. Which ever VP candidate receives at least 51 votes is declared the winner. If you were paying close attention you might have noticed that it is possible for the president and vice president to be from different parties in this scenario! d) before Andrew Jackson claimed to have been robbed of the election of 1824, most people didn't consider the popular vote count important since the Electoral College decided the presidency. Most historians use 1824 as the starting date for popular vote returns because of, what a Congressional Quarterly publication calls, the "availability, accessibility, and quality" of the returns since then. This quote is from a short article I wrote called "The electoral process before the 12th Amendment". The article attemptes to explain (apparently unsuccessfully!) how the Electoral College worked before being retooled in 1804. It's a bit hard to explain, but easy to understand once you get it. Maybe an example would be easier to understand. Let's say there are 10 electors who each cast 2 votes. We will end up having 20 votes (10 electors x 2 votes each = 20). Using the criteria above, what is the number of votes required to win? More than 10? No, that would be a majority of all 20 votes - that is not what we want. More than 5? Yes, that is the majority of the 10 electors. Here's an actual example from 1796. That year there were 138 electors who each cast 2 votes for president, for a total of 276 electoral votes. John Adams was named president after winning 71 votes. 71 is not a majority of the 276 electoral votes cast. However, 71 is a majority from the 138 electors. In the first presidential election the states used several different methods of choosing electors. In Connecticut, Georgia, New Jersey, New York, and South Carolina the state legislature chose the electors. Maryland and Pennsylvania had a statewide popular vote. Delaware and Virginia had a district by district popular vote. New Hampshire and Massachusetts used a mix of popular vote and legislature choice. On February 4, 1789, 69 electors met in their states. Since this was before the 12th Amendment, each elector voted for 2 different people for President. 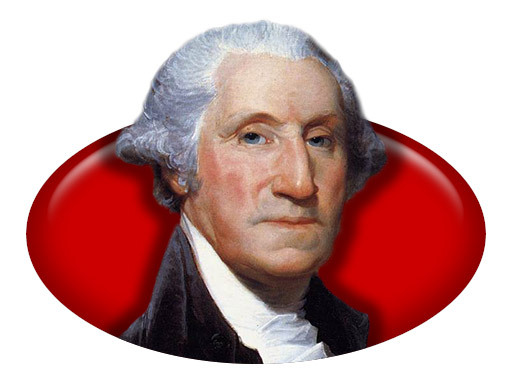 Washington was one of the names on every ballot and is therefore considered to have been elected unanimously. "Each State shall appoint, in such Manner as the Legislature thereof may direct, a Number of Electors..."
So if a state wants to use a "winner take all" system they may. Technically if a state's legislature wanted to cancel their election and flip a coin to determine electors they could! Though I doubt those legislatures would be in office for long! Because I'm too lazy to update them! Just kidding -- a little! Some pages (like this 1992 election page) have the new style of the website, while many others (like this 1980 election page) use the original style of the website back when it was created in 1999! Basically, updating those individual election pages to the new style is a huge project so I usually do them one at a time as I get the time -- but it's not a huge priority for me. Hopefully one day the whole site will look consistent and that's when it will be time for a new style and I'll have to start all over again! The older style pages may not be as pretty but the info is still pretty good. But as I update the style and graphics, I am also updating all the facts and figures as well, from the hodge-podge of sources I originally used to a few more reliable and consistent sources. This is the most frequently asked question I get! Keep in mind that I started the site well before the 2000 election. Before then I doubt many people could remember what colors were used on network electoral maps! "The Red States" and "The Blue States" were terms that had not been coined yet. And the reason is simlple -- it has not always been that way. In fact in past elections they could have talked about the "White States" and "Yellow States" based on different colors used by different media outlets! Check out this Wikipedia page, this Washington Post article or this Smithsonian.com piece for more info on how it used to be. As for me, I watched my first election night as a kid in 1980, and I loved the colored map in the background. During subsequent elections I made my own map so I could keep track. I always used blue for Republicans and red for Democrats. I did this because that is the way it was in my memory of the 1980 election. There was also a computer game in the 1980's called "President Elect" and that game used blue for Republicans and red for Democrats. So, I basically do it for personal nostalgic reasons! I'd often considered switching the colors since these days a lot of political junkies are used to them being the other way around. But I worry that I might be more prone to make mistakes on the site if I don't use the colors my brain is used to. Even on election night I have to make a conscious effort to remember which color goes with which party on the TV networks! But with an update of the site graphics and style in progress I have decided to go ahead and switch the colors on the map since so many people have requested it. Republicans will now be red and Democrats will be blue. As each previous election page is updated the historic maps will also be redone to match. So far the past few elections have been converted to that color scheme. The Electoral Map Analysis is my personal view of how the election is panning out. It is based solely on my opinions. I look at polling data, past elections, the campaigns, and anything else I think might effect the outcome. In the end, I choose how all 50 states and DC will be colored. I consider the final analysis to be the "Official Projection of President Elect". The Computer Analysis is exactly what it sounds like: a computer decides how all 50 states and DC will be colored. The analysis is based on a formula I created back in 2000. The results of each election from the past 40 years are used to determine a state's voting tendency. Then every week I input the latest state by state polling results. The computer crunches the numbers and spits out its projections. Other than having created the formula, I have no say in what the computer does with each analysis. I simply take what it gives me and dutifully report it - whether I agree with it or not. The computer did a better job than me in predicting the 2000 election, but my analysis trumped the computer in 2004! First of all let me defend our projections by mentioning a few facts about this site's history - if you'll allow me to brag a bit! 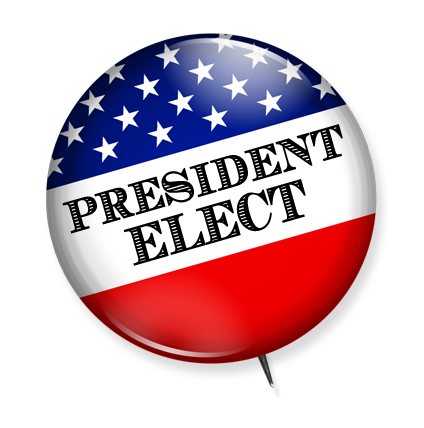 President Elect was one of the first (non-commercial) websites to do Electoral College projections. Our first projection went up back in 1999, back in the days when most people were blissfully unaware of the Electoral College. And we start our projections well before other sites even are thinking about the election. For example, our first 2004 analysis went up in August of 2002. Last, but certanly not least, the 2004 analysis was the only predictor I ever found that stated the day before the election, with 100% accuracy, how every state ended up voting! There are several reasons we don't update as often as some other sites. First, Electoral College projections are all but meaningless the further you are from election day. Our 2002 and 2003 analysis were basically just exercises in different hypothetical scenarios. Our 2004 updates were only released every few months at the beginning of the year because there were not many state-by-state polls to use, and because the information just wasn't that useful that far away from the election. As the election drew closer we started updating more often, but not more than once a week. Since state polls only come out a few at a time, it makes more sense to me to wait a week and gather them all together rather than waste time re-coloring a map because one state changes shades! The second reason we don't update as often as other sites, and probably the more important reason, is that this is not an election projection site! I view President Elect as more of a historical record of past elections, and that is where my interests are. I do the current election page as a service to our readers who want an objective view of where the race stands from someone not trying to sell them on a particular candidate or a particular point of view. My goal is not to advance "my" candidate or to keep "my" side of the race informed on where things stand. What I try to do here is look at the race from a historical perspective, not a partisan perspective. I'm more interested in accurately predicting the results of the election than I am in seeing if I can help change the results. Keeping up with all the candidates (including the third party ones!) and the state and national polls helps me develop a sense of where the election stands as an historical event. That is why I do this, and that is why I find doing non-stop updates is unnecessary for this site. That said, I have to admit I'm a bit of a junkie for election sites that do update at all hours of the day, every day of the week! 2) four minor parties beneath (second tier). The ONLY order I can ascertain for your second tier has the most 'Liberal' on top descending to most 'Conservative' on bottom. The listing is NOT alphabetical by Party. The listing is NOT in order of oldest party continuous in the US. The listing is NOT in order of most states on ballot. The listing is NOT alphabetical by Presidential Candidate. The listing is NOT by Party with most potential Electoral Votes. There is a logic to it, but I'm afraid you'll be disappointed if you're looking for bias! The parties are listed in the order that they came in in the last election! They are listed first by electoral votes; if they have none, they are listed by popular votes. In 2000 the "second tier" parties popular vote order was GRN, REF, LIB, CON - that is the order I have listed them in during the campaign of 2004. I did the same thing when I listed the candidates during the 2000 campaign. They were listed in the order they came in in 1996. I get these types of emails all the time - from both sides of the political spectrum! Which proves to me that the site isn't biased at all if people of all leanings can find what they see as "bias"! I get a 50/50 ratio of people accusing me of being biased toward the left or the right. But in the months after the 2000 election the ratio went up for conservative bias because I was defending the Electoral College and, therefore, must be a Bush supporter. What most failed to realize is that the site had been defending the Electoral College for over a year and a half before the 2000 election! In fact in the days leading up to that election when some analyists were predicting just the opposite of the actual result - that Bush would win the popular vote and Gore the electoral vote - I was just as strongly defending that possible outcome as I did the eventual outcome. The site is not biased. More likely is you are letting your personal biases color what you are seeing. Also please keep in mind that not everything on the Articles page was written by me! The article I assume you're complaining about ("An analysis of the U.S. Presidential Election of 2000") was written by one of our readers, and does have a bit of a leftward tilit to it. However, posted a day before that article was another analysis of the 2000 election ("The Founding Fathers' View of the 2000 Controversy") with a bit of a rightward tilt to it, also written by a reader. I used to play that game too! I still have the original manual! The developer of the game, Nelson Hernandez, contacted me during the 2004 election and couldn't have been nicer. However, this site has no connection with the game, other than the game helping shape my views on the Electoral College. You might be able to find a copy on Apple II or Commodore emulation sites. My analysis is not based purely on polling data. It is based on my (fairly educated and non-partisan!) opinion of what is going to happen. My opinion is, of course, based largely on current state by state polls (such as Rasmussen, Mason Dixon, Gallop, Zogby, local newspapers, etc). However, I also take into account (to a lesser extent) state voting trends, and other intangibles. The computer analysis uses current state by state polling data and election results from the past 40 years. I think the fact that both of our analyses use past voting tendencies in each state before making a prediction may have been one of the reasons we did so well compared to other outlets that made predictions in 2000. Though it is a little upsetting that the computer analysis was the best predictor of all - beating even me! You can see that scorecard online. And in 2004, my projections predicted with 100% accuracy how every state ended up voting! Feel free to send your Frequently Asked Questions about the Electoral College, presidential elections, and this website to faq@presidentelect.us. Or you can use the form below to send your questions. Email addresses are optional but only the most common or most interesting questions are posted to the website. In either case your email address is not used for any purpose other than to respond to your messages. THE SUBMISSION FORM IS CURRENTLY DOWN. PLEASE USE THE ABOVE EMAIL.